With it's trio of traditional red and white mushrooms and tiny little Ladybird for luck, surrounded with moss and flecks of Fairy sparkle... this will delight any whimsical lover. 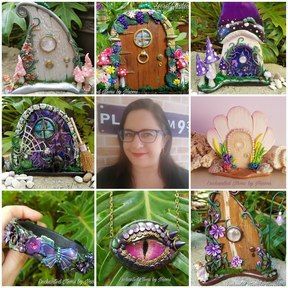 This magical little scene is made from polymer clay and placed in a glass dome with bronze jewelry fittings, including a key charm hanging in the side. Comes in a gift box and matching necklace. Approx. Size is 4cm long x 2.5 wide. Necklace length is 64cm long. Not suitable for children under the age of 3years old/adult supervision is required. This necklace needs to me handled with a little care.